Oh, did I say March? Um, I meant August. You know how I mentioned below that the new issue of Vegan Lunch Box would be out in March? Well, as so often happens in the world of professional publishing, there’s been a change of plans. The publisher has decided that it will be much more exciting to bring the book out in late July/early August, in order to generate lots of excitement at back-to-school time. I can see the logic there, but I’m still sad to have to tell you all that the book won’t be available for several more months. Doh! 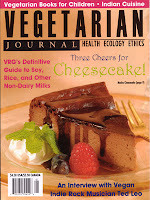 In other news, the latest issue of Vegetarian Journal (Volume XXVII, No. 1) includes a very nice review of the old, self-published version of Vegan Lunch Box. I want to tell all the VJ readers out there not to worry: all the recipes listed in the review will be in the new edition out in August, along with new recipes you might like to try out, too. Hey, I also noticed that this issue also includes an article on "Veggie-Friendly Literature for Kids", listing dozens of storybooks, novels, poems, and more that encourage and support compassion for animals and an understanding of vegetarianism. 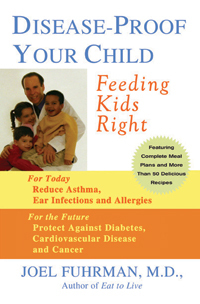 The books are divided by age group, from preschool to teens. All that and seven recipes for vegan cheesecake! Woo! Lately my favorite non-dairy frozen treat is a simple frozen fruit sorbet: I push frozen bananas, pineapple, and strawberries through my Champion Juicer and out comes perfect, creamy sorbet with no added sugar. 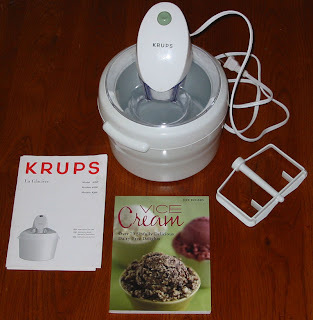 But before I switched to sugar-free, I used to make luscious non-dairy ice creams using a Krups La Glaciere Ice Cream Maker and the book Vice Cream: Over 70 Sinfully Delicious Dairy-Free Delights. The recipes are simple and far better than any vegan ice cream I've bought at any store. The "milks" are from nuts, which give the ice cream a rich, creamy sweetness. Chocolate pecan was our favorites, but once you understand the basic proportions you can make practically any flavor you like. In case any of you are interested, I'm selling the ice cream maker and book together as a set on ebay. I hope they go to a good vegan home, one that will use them to make many, many wonderful, non-dairy delights.